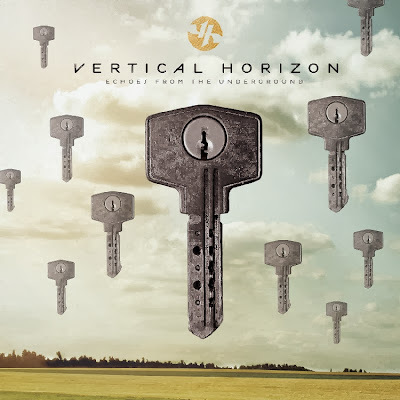 Discussions Magazine Music Blog: VERTICAL HORIZON/Echoes From The Underground: Brand NEW Album available October 8th, 2013! VERTICAL HORIZON/Echoes From The Underground: Brand NEW Album available October 8th, 2013! Vertical Horizon released their breakout album, Everything You Want, in 1999 and the single and title track “Everything You Want,” captured the #1 spot on Billboard’s Hot 100 and Adult Top 40 charts, and became Billboard’s Most Played Single of 2000. Having carved out a page in music history the band garnered further radio attention with “You’re a God” (#4 on Billboard’s Adult Chart) and “Best I Ever Had (Grey Sky Morning).” In 2005, “Best I Ever Had” became a top 20 country hit for country star Gary Allan. In addition to writing and producing songs for Vertical Horizon, Matt has spent the past few years writing songs with and for other artists. In 2010 he wrote “Wish You Were Here” for the band Hey Monday, featuring lead singer Cassadee Pope, who went on to win season 3 of NBC’s hit show The Voice. In 2012 Scannell teamed up with Daniel Powter to write “Come Back Home,” which was used to promote NBC’s “Chicago Fire.” Scannell and Grammy-winning songwriter/producer Richard Marx collaborate often and sometimes play acoustic duo shows together. They co-wrote Marx's 2012 AC hit “When You Loved Me,” which reached number 15 on the Adult Contemporary Chart. Vertical Horizon will release their new album, "Echoes From The Underground" on October 8th. The title of the album is a lyric from the song "Evermore.” It captures recurring themes throughout the record, such as a emotional and physical distance, as well as the often-hidden layers of emotion that exist within relationships. Neil Peart from RUSH guest drums on the album. The first single, “Broken Over You,” is available for download on VerticalHorizon.com. This summer, the band takes to the road as part of the Under the Sun 2013 national summer tour with Sugar Ray, Smash Mouth, Gin Blossoms and Fastball.